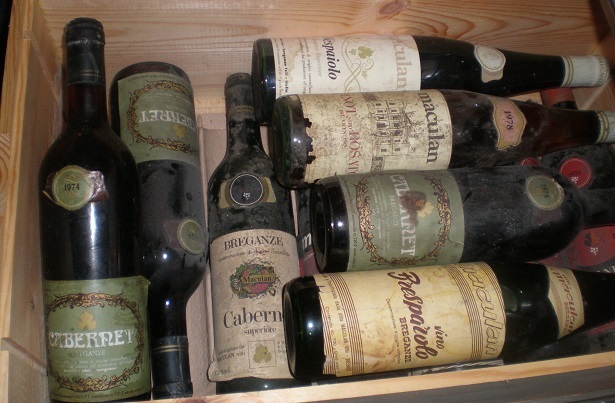 Fausto Maculan is one of the great characters in the world of wine. His larger than life personality, wicked sense of humor and charm are all reflected in these gorgeous wines. Much of Maculan’s vision is clearly informed by a huge passion for the finest wine and food money can buy. The eye-popping collection of lovingly cared for icon bottles in Maculan’s personal cellar is but one sign of the heights this driven producer strives for. 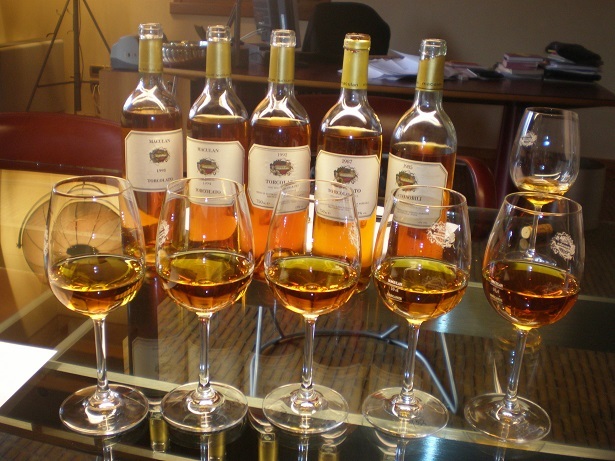 Maculan is best known for his dessert wines, and rightly so, as they represent a glorious pinnacle of achievement. That said, Maculan is proving to be equally skilled with his dry red wines. This incredible tasting covered a number of older vintages of Maculan’s top reds, Fratta and Crosara, and sweet dessert wines Torcolato and Acininobili. The Maculan estate is located in Breganze, just north of Vicenza. 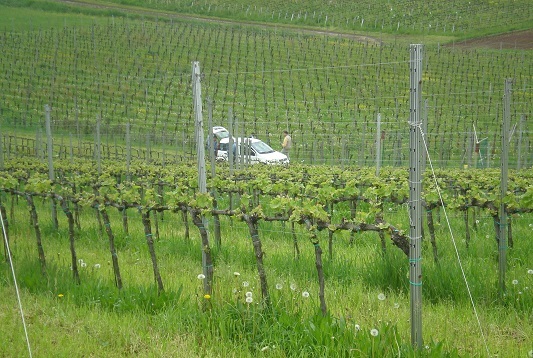 The vineyards are sprawled throughout the surrounding hills and are some of the most meticulously cared for vines I have ever seen. Though fairly non-descript on the outside, the winery is impeccably appointed inside. Maculan’s Fratta is a Bordeaux inspired blend of Cabernet Sauvignon and Merlot, with the Cabernet typically making up 70-80% of the blend. The wine spends 12 months in new French oak prior to being bottled without fining or filtration. Over the last few vintages, Fratta has emerged as one of Northern Italy’s most compelling reds. This vertical was fascinating as it traced an arc of development shared by so many Italian red wines. During the mid to late 1990s, Fratta was made in the style of the time, which is to say with an eye towards achieving as much color and intensity as possible through the heavy use of small French oak barrels. Today’s wines are made with a lighter touch with regards to cooperage and as a result a remarkable purity of fruit has begun to come through. The 2007 Fratta, tasted from barrel, is wonderful for its richness. This expansive, soft Fratta offers up red berries, herbs, licorice, spices and French oak. Today the wine is surprisingly accessible, but it will almost certainly firm up in bottle. In 2007 Fratta is 62% Cabernet Sauvignon and 38% Merlot. (92-95)/Anticipated maturity: 2010-2017. The 2006 Fratta (80% Cabernet Sauvignon and 20% Merlot) is a touch disjointed at this stage. Wild cherries, grilled herbs, earthiness, leather and roasted coffee beans emerge from this wild, unrestrained Fratta. The 2006 needs time to come together but it is shaping up quite nicely. 93+/Anticipated maturity: 2011-2021. The 2005 Fratta is soft, round and beautiful, with no hard edges. This medium-bodied Fratta possesses gorgeous harmony in a medium-bodied style that should drink nicely with minimum cellaring. In 2005 Fratta is 68% Cabernet Sauvignon and 32% Merlot. 93/Anticipated maturity: 2010-2020. The 2004 Fratta (66% Cabernet Sauvignon and 34% Merlot) has developed splendidly since I last tasted it. A seamless wine, it emerges from the glass with superb pedigree in an extraordinary, layered expression of dark fruit. Everything is in the right place in this magical, spellbinding Fratta. 96/Anticipated maturity: 2010-2022. The 2003 is a round, gorgeous Fratta. The heat of the vintage has robbed the wine of some aromatic complexity, yet a surprising level of freshness remains. I don’t see the 2003 ever developing into a super-complex wine, but it will drink splendidly over the coming years. 2003 is among the vintages where the harvest took place in August; the others are 2000 and 2001. The 2003 Fratta is 77% Cabernet Sauvignon and 23% Merlot. 93/Anticipated maturity 2009-2019. The estate’s 2001 Fratta is in a beautiful place today. At eight years of age, the 2001 is the first wine in this tasting that shows a measure of tertiary nuance. The essence of roasted coffee beans, leather, spices and grilled herbs add complexity to a core of dark fruit. The wine possesses exceptional balance and long, powerful finish. In 2001 Fratta is 53% Cabernet Sauvignon and 47% Merlot. 94/Anticipated maturity: 2009-2021. The 2000 Fratta is impressive. It is another of the riper wines in this line-up, with gorgeous, seamless dark red fruit followed by notes of espresso, leather and spices that develop in the glass. The 2000 is one of the more complete wines at this stage. The 2000 Fratta is 54% Cabernet Sauvignon and 46% Merlot. 92/Anticipated maturity: 2010-2020. The 1999 Fratta (67% Cabernet Sauvignon, 33% Merlot) is a dense, full-bodied offering bursting with dark fruit. This richly-textured wine is more volume than nuance, but it offers terrific balance and a fine sense of harmony, with firm yet elegant tannins that frame the close. 92/Anticipated maturity: 2009-2017. I was quite taken with the 1998 Fratta. It is a sensual, exotic wine laced with truffles, herbs, spices and leather, all of which come together in an intense, full-bodied style. The wine reveals tons of density and a long, resonating finish. In 1998 Fratta is 69% Cabernet Sauvignon and 31% Merlot. 93/Anticipated maturity: 2009-2018. The 1997 Fratta is, as one might reasonably expect, the most forward of these wines. Though quite beautiful, the wine is fairly advanced in its soft dark fruit, earthiness and beef bouillon. It is a pretty, mature wine perfect for near-term enjoyment. The 1997 vintage was blended by Paul Pontallier of Chateau Margaux. The blend consists of 72% Cabernet Sauvignon and 28% Merlot. 92/Anticipated maturity: 2009-2015. Maculan’s Crosara is a 100% Merlot that is only made in the best years. 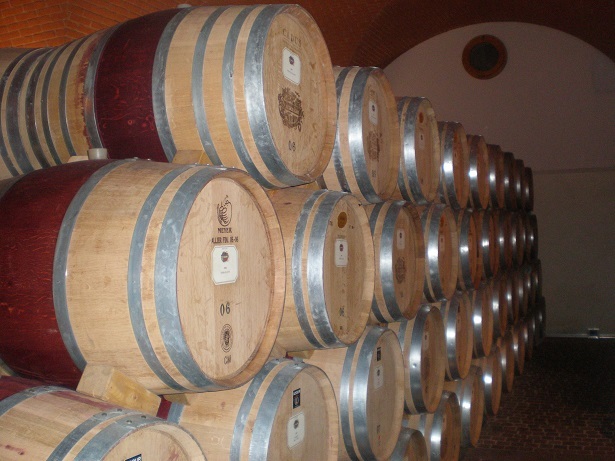 The wine spends 12 months in new French oak barrels prior to being bottled without fining and filtration. The first vintage was 2000. Although the wine has compiled a brief track record so far, early results are striking. The 2007 Crosara, tasted from barrel, is a dense, full-bodied wine that flows with tons of fruit in an expansive, seamless style. The 2007 is of course very young, but it shows tons of potential for the future even at this stage. (92-95)/Anticipated maturity: 2015-2025. The 2005 Crosara is an intense, vibrant wine. An array of violets, dark fruit, herbs, minerals and spices emerges from a tightly-wound, powerful frame. The 2005 clearly needs further bottle age, but there is a lovely sense of weight than simply needs time to emerge. This is a far better bottle than the one I reviewed in my previous article. 93/Anticipated maturity: 2011-2020. The 2004 Crosara blossoms on the palate with layers of ripe, dark fruit. Deceptively medium in body, this beautifully balanced Crosara shows remarkable harmony and finesse. Sweet notes of menthol and licorice linger on the finish. The 2004 remains surprisingly primary at this stage. Further bottle age will only help all the elements meld even more than they are at present. 95/Anticipated maturity: 2012-2024. The 2003 Crosara reveals a touch more density than the 2003 Fratta. It is also further along in its evolution. Dark fruit, leather spices come together in this elegant and harmonious Crosara. Ideally the wine is best enjoyed within the next few years, as the 2003 appears to be on a relatively fast track with regards to aging. 92/Anticipated maturity: 2009-2016. The 2001 Crosara is endowed with impeccable balance. Wonderfully sweet and layered, the wine flows from the glass with dark cherries, leather, spices and minerals in a rich, expansive style that coats the palate with stunning elegance. The tannins are broad yet sweet on the finish. This gorgeous Crosara is capable of developing beautifully for at least another decade. 96/Anticipated maturity: 2009-2019. The estate’s 2000 Crosara is a round, sumptuous wine bursting with generous dark fruit. There is wonderful richness and depth to be found in the glass in a style that is a touch more powerful than the 2001. This is another superb Crosara. 95/Anticipated maturity: 2009-2019. 1998 Torcolato offers up apricot jam, spices, and white truffles in an elegant, refined style. The wine remains incredibly fresh, vibrant and vivid all the way through to the close, showing great balance and polish. It is almost impossible to believe that this is an 11 year-old wine! 93/Anticipated maturity 2009-2019. The 1994 Torcolato flows with the essence of graphite, minerals, spices and orange marmalade. Floral and mineral notes are woven throughout the fabric of this rich, masculine dessert wine. Today the 1994 comes across as slightly more powerful than the 1998. It, too, is fantastic. 94/Anticipated maturity: 2009-2017. The estate’s 1992 Torcolato has taken on petrol-like aromas and flavors that recall Alsatian Riesling. Most of the primary fruit has faded, while an array of complex tar, smoke and minerals vie for center stage. This is a sumptuous, focused and utterly spellbinding Torcolato to marvel over. 92/Anticipated maturity: 2009-2017. The 1987 Torcolato is a sumptuous, opulent and utterly compelling wine that covers every inch of the palate with a kaleidoscope of tar, licorice, candied orange peel, licorice, incense and spices. The wine remains energetic and poised with sumptuous, wonderfully complete personality that words can only fail to describe. 95/Anticipated maturity: 2009-2017. What is there to say about the 1985 Acininobili? At nearly 25 years of age it is in its sweet spot (no pun intended) with no signs whatsoever of fading. This is an impeccable, vivid Acininobili blessed with exceptional balance and tons of nuance. It is the perfect wine with which to finish this unforgettable tasting at Maculan. 96/Anticipated maturity: 2009-2015.